Good looks and soft! I like the design and natural tones. Using sometimes as a bed spread for twin bed. 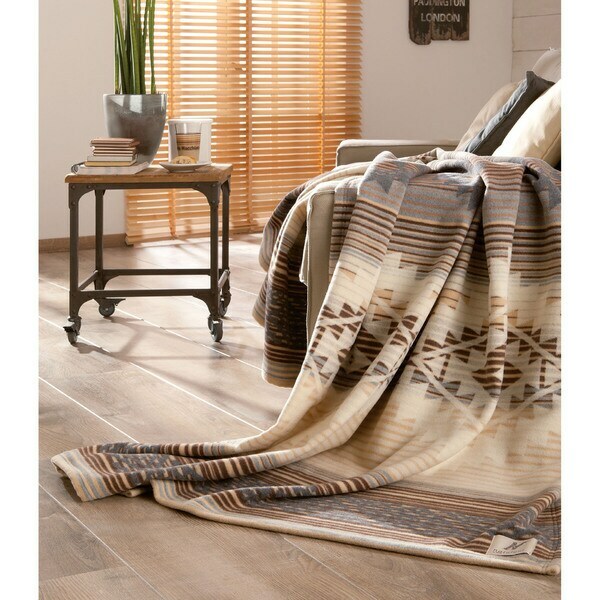 Keep the cold away with this throw, featuring a beautiful Southwestern Inspired Design in earthen tones. The Blanket is jacquard woven, and of deluxe soft Cotton/ Wool quality that provides the desired warmth and comfort, allowing you to cuddle, pamper yourself, and feel special. Machine wash warm water. Tumble dry on low heat. Do not bleach. Dimensions 78.0 In. X 59.0 In. X 0.3 In. Ibena wool/cotton combo make this super lightweight, yet warming. If you like merino wool, this won't disappoint. If you're sensitive to wool, the texture may still bother you. If you're looking for weight, this is light. I happen to love merino, and so I couldn't be more pleased with the quality, texture and neutral pattern. For me, this is a wonderful soft and cozy blanket. I would like to catch another one here on Overstock that has the more vibrant color scheme to give as a gift. Unfortunately, it's frequently out of stock. Soft and warm with the perfect weight. You can feel the high quality with one touch. This was a gift for my son. He opening the package and immediately wrapped himself up for the rest of the day. The colors are subtle and fit their decor. I would definitely recommend and order again. Great soft beautiful throw.. very good quality! Would recommend to a friend..
Love this throw and it came at the right time - on our first snow! Since this is our first winter without geothermal heat in 15 yrs., the adjustment has required additional bundling up with throws, etc. 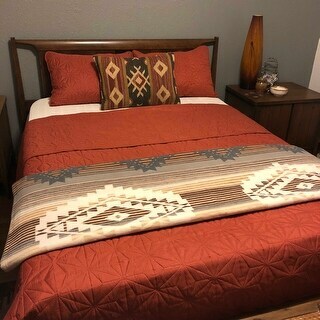 The design is wonderful, goes well with our Native-Southwestern motif. Not overly heavy but toasty just the same. What a beautiful blanket! Workmanship and materials are beautiful. I purchased this item to throw on the back seat of my new truck, which I don't use much. The perfect size. Just wanted a little extra protection. I would highly recommend as a throw. Just perfect. Love the colors and the softness. I would buy this again and recommend it. Prefect colors and softness. Washes up beautifully. This oversized throw is very soft. The grey has pretty significant blue undertones, the other colors are soft brown, beige, tan and cream. The throw is shown on a full sized bed and just covers the top. What a special throw this is. The colors are just perfect to go with my sofa and throw pillows. The fabric is very cozy, but not hot. Just the thing to snuggle up to and watch TV! Beautiful neutral colors and so soft. Machine washable a plus. Bought this as a present for a friend and she thought it was so pretty, she cried. Best blanket ever! It matches our bedroom décor perfectly. We love it. As soon as it arrived, my husband wanted me to order another one also. "What is the % of cotton and the % of wool?" This blanket is 70-percet cotton and 30-percent wool. Looked great and the price was good.